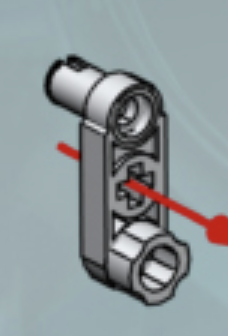 who can help me to find this part to buy in the lego shop. I need this one in the middle. It has 3 holes, two with a cross an the one above with a hole. The part number is 33299. It's not available from the pick a brick section of the lego site but is available in 3 different colours from bricks and pieces in the replacement parts section. Alternatively you can get it from Bricklink here .